Textillia is an online community and database for all manner of sewing and fabric enthusiasts! The only things we don't accommodate are knitting, crochet, spinning, and weaving, as Ravelry's got those all taken care of and we love Ravelry too! The word "community" gets thrown around a lot these days. When we say community, we're talking about all of us: each individual Textillia member whether this is your hobby, or your job, or you own a sewing related company. You are why this project exists - our goal is to make this a useful and beautiful space for all sewists, our collective cozy sewing space online. 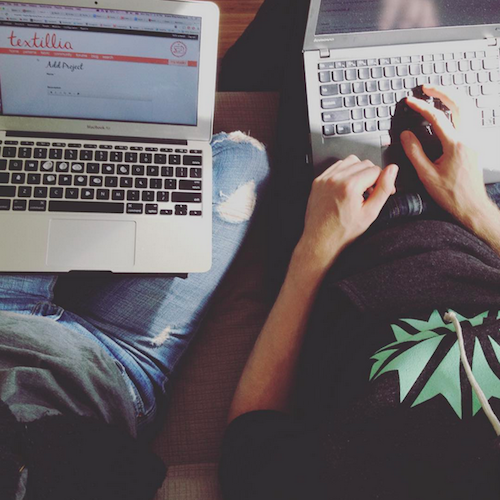 We've intentionally created Textillia in a way that puts this community at the centre and foundation for the long term. Because we're not financially backed by any companies or funders, the decisions we make are driven solely by what best serves this community. You get your own profile page to show who you are, what you do, and what you make! You can talk in the forums about tools and techniques, ask for help, and find other sewists in your hometown or with shared interests. If you own a company or fabric shop, or are a designer, when you join you can set up your business page(s) at no extra cost, and many more features will be added to these in the future. The community's latest and greatest designs, products, and projects will be displayed in various parts of the site, and our favourites will also be featured on the homepage. You can get to know lots of great crafty people, and stay up to date on what your friends are working on! Work together on our community built searchable database of all patterns, fabric, and thread that are cross-referenced with each other, the projects members use them for, as well as the companies and people that designed and produced them. Search a structured index of designers, companies, and shops (both online and brick and mortar), cross referenced with their products, and linked to community members who work at or own them. Plan and document your projects, and cross reference them with the patterns, fabric, and thread you've used. Inventory and maintain information about your fabric and pattern stash, like whether your fabric is pre-washed, and how much you have, and whether your PDF pattern has been printed and prepped! Look up a given pattern or fabric and see other members' finished projects using it. And of course, we plan to add all kinds of additional features and tools as time goes on! We are Ariane and Bruno, a couple living in Vancouver, Canada. Hi! Ariane learned to sew as a teenager growing up in Saskatchewan (the Canadian prairies), and even had a short-lived small business making organic cotton bags and accessories while earning a Masters in Health Geography. An artist at heart and a long time crafter, Ariane formerly worked in the open source web development world (where she met Bruno! ), and did a term as Documentation Co-lead for the Drupal open source software project, which is the software used to build Textillia. 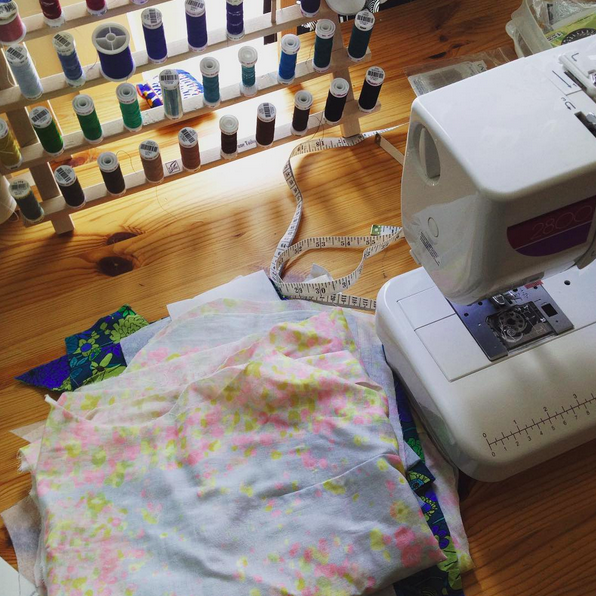 A few years ago, worsening chronic illness forced her to stop working and during that time she took up sewing again as something to pass time on better days. She sewed her first garment a couple years ago and fell in love! After much soul searching, it became apparent that starting Textillia was an exciting chance to create a "family business" that would accommodate her disability and enable her to build a flexible career doing something she loves. When not working on Textillia or sewing, Ariane enjoys watching Star Trek (TNG) with Bruno, patting strange dogs, oohing and ahhing over birds and plants, drawing, writing, growing a garden, reading books, drinking tea, and appreciating all the small joys in life. Bruno is from Belgium (not so coincidentally, the birthplace of Drupal) and studied journalism before discovering his passion for web development and independent media. 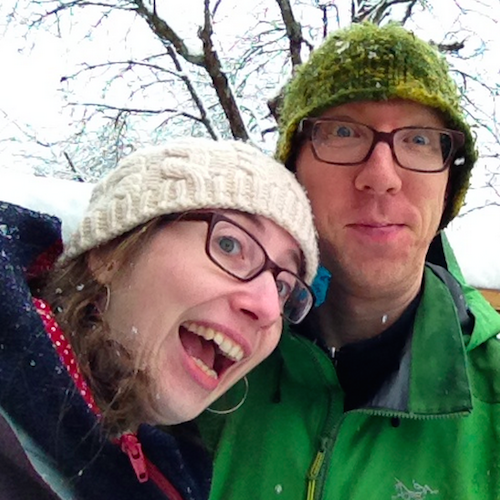 After working in web development and at Belgium's biggest independent media website for a decade, he fell in love with this Canadian girl he met at a web development conference (that's Ariane!) and uprooted his life to move to Vancouver shortly thereafter. Since then, he's been doing web development work for non-profits and academic institutions for a few different companies in Vancouver, and most recently built a popular new Canadian independent news website. He's been active in the open source web development and independent media communities for many years, and has even co-authored a couple books on Drupal and media activism. All this, while being an awesome partner and support to Ariane, swimming and doing yoga, learning to grow vegetables, singing as a tenor in a classical choir, and hoping somehow it will finally snow again this winter so he can go snowboarding! Why did you build Textillia? Because it was long overdue that sewists have a home online! We know how valuable and beloved Ravelry is in the knitting/crochet/weaving/spinning community, and as Ariane began sewing more, she constantly found herself wishing for "the Ravelry of sewing". At first it seemed pretty pie in the sky to take this on, but the more we thought about it, the more it made sense. Bruno was itching for a highly challenging web project of his very own (something he'd long hoped for, but never expected would be in sewing!) And for Ariane, it's a way to create her own job that truly accommodates her physical needs—and not just any job... a dream job with one of the best, most inspiring communities there is. It's a dream come true for both of us. Who's funding this? Where is the money coming from? Are you backed by a big company or investors? It's really just us: Bruno and Ariane, the skills we've cultivated over the last 15 years, and a dream that became a plan. We have a vision of a beautiful, fulfilling long term career building a beautiful, functional Textillia for all of us, and being a part of this fantastic creative community for a long, long time. We've kept overhead costs low by building everything we could ourselves little by little, and covered any additional costs out of our own pocket. Sure it's a small risk, but because of that we're not backed by any companies or investors, and not swayed by loyalties to anyone but ourselves and the Textillia community. You may be wondering how we plan to fund this project as it grows. This is something we've spent a lot of time thinking about, discussing, researching, and weighing the pros and cons around. This may come as no surprise to those of you who have been seeing the shifts in how online services are run these days, Textillia is going to be a subscription/membership-based community. In the beginning while we're in beta, still improving the site and working out the initial kinks, it will be free (and after we're no longer in beta, we plan to continue having a first month of free membership for new users, so that everyone gets a chance to explore what the site is before committing). After that we plan to charge a very affordable monthly membership fee. We'll be setting the price low and it will stay that way, because it is important to us that it be accessible to you. We know we could charge more, but instead we are taking a deep breath and believing that what we've built is not just good but great—and that enough of you will agree and support it (and us! ), to make our low price sustainable. Update: more info on the membership plans here - spoiler: they'll be just $20 USD per year. Ads, sponsored content, commissions, affiliate programs... they've become a common and often confusing part of the ecosystem of "free" websites. Many sites function like this because they started out years ago, and that's how they've adapted to survive. But this model of online business is very broken and going the way of the dinosaur, especially for websites that weren't lucky enough to have been built 5+ years ago and already have a huge following. The truth is, there's no such thing as "free" when it comes to websites—either you pay with money, or you pay by having your data tracked and sold, or using a site full of ads and affiliate links, some of which eventually lose sight of their original purpose. All large sites make money one way or another, because building and maintaining a large site costs a lot of money, not to mention people deserve to be compensated for doing their jobs and providing a service or product. We are choosing the path we feel will be most sustainable and lead to the best quality in the long term. How wonderful is the idea of a website where you never have to wonder whether someone is being paid for their so-called "opinions", or whether you're reading content vs. an ad? Where it's free of clutter, and all the focus is 100% on making the site and its content better? We think it's a breath of fresh air and hope you'll agree. Being a membership-based site will be what makes this whole project realistic and what gives us the chance to make it great—Textillia will have a healthy chance at long-term survival from the get go. Each individual person who becomes a member, whether sewing is your hobby, you're an independent designer, or you own a big 4 pattern company, will pay that same membership fee and have the same access to the site and our community. No hidden fees or agendas. A clean and modern design, loads of functionality, and this cozy corner of the internet to call our own. Textillia scholarships and grants? A Textillia Kiva loan program? Helping fund camps and workshops and conferences? Sponsoring environmental stewardship and social change projects in the textile industry? Sponsoring sewing equipment donations to Tool libraries (can you imagine being able to rent an overlocker for a week super cheap?!) Interactive journalism stories on sewing and the textile industry? The sky is the limit, and we are looking way up. We come from a background in learning, activism, and open source (aka. community built free) software, and it's very important to us that this project benefits and empowers us all. We hope that Textillia will become so much more than just a website—we truly hope to bring together the sewing world just like Ravelry did for knitting. If you have any questions, feel free to contact us on social media or email us at [email protected] and otherwise we'll see you around!